Leila's Lenten Season | This is about my Easter Lent experience. I used homemade blackberry jam and Adams peanut butter. Use olive oil and grill just like a cheese sandwich. The fig bread came courtesy of my good friends, Essiet and Sylvia. Thanks guys! Someday (I hope), I will begin Lent with a plan. And a fully stocked pantry. I imagine planning out menus and writing out shopping lists. I imagine sitting down to every meal, balanced and nutritious, served at the appropriate times of day, calm and cool, with a clean kitchen at my back. I imagine choosing from an assortment of baked goods, or a bowl of fruit salad, chilling in the fridge, whenever I get the urge to snack. Hmmm, do I want the vegan chocolate cupcake with the tofu frosting, or the vegan apple pie, or the vegetable samosas I made this morning? Hmmm. Of course, that is just about the exact opposite of what actually happens. Here’s what happened today…I woke up at 7:15 a.m., I realized that Joey would be working at Aladdin Cafe today and so I didn’t have to fix him lunch (let Diyana feed him, I said to myself). Then I hit the snooze button. Fast forward to 8:00 a.m.. Maddy’s gotta leave at 8:18 a.m.. She needs breakfast and lunch. Lenten breakfast and lunch. OK. Breakfast – toast with jam, and a cup of tea. And for lunch? Drum roll please…toast with peanut butter and jam! Yep! Not even a different kind of jam. And by the way, I may as well admit it, I would have put peanut butter on her breakfast toast if I wasn’t planning on putting it in her lunch too. And what did I pack with the pb &j? Nothing. Not the best start ever, gotta say. But she was really gracious about the whole thing, which was pretty awesome. After walking her to the bus, I went to my yoga class. Then shopping! At least I made a start. I agreed to go to a Barre 3 class with my friend, Louise, at noon, and she found me walking home from the store, on her way to pick me up. We got to my house and I said, “can I grab something quick to eat?” I offered her something too. And so we both ate…toast with peanut butter and jam. On the way home from the Barre 3 class, (I’m gonna be sore tomorrow), inspiration struck! “Drop me off at Aladdin’s!” I said to Louise. Diyana to the rescue! Joey was just finishing his shift, and I sat and visited with him and Isam and Diyana, while she fixed me a sweet little lunch – hummous, baba ghanoush, tabbouli and freekeh! (Freekeh is green wheat, prepared here like a pilaf. Yummy!) I also bought five loaves of Arabic bread so I’d have some for dinner! Let me tell you, it pays to live three blocks from an awesome Syrian restaurant filled with delicious, Lenten food! Anyway, by dinner, I had things much more under control. As you can see, I was able to provide a full meal for those of us observing the fast, and those of us who aren’t. 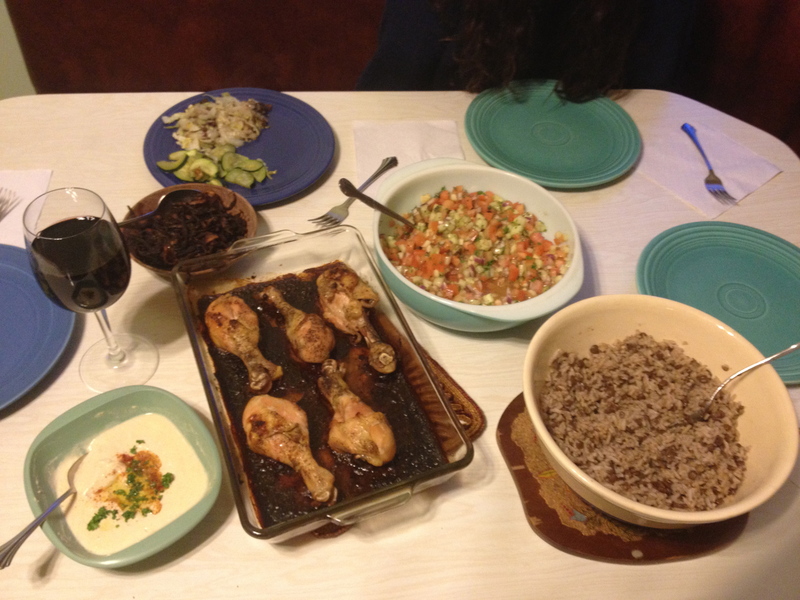 There was baked chicken, imjudra with fried onions, hummous (from Aladdin! 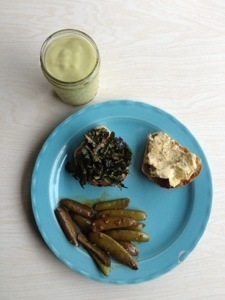 ), roasted cabbage, raddichio and zucchini (on my plate), tomato and cucumber salad, and bread! The hardest part for me is the part about leaving the table feeling as if you could have eaten a little more. I still haven’t done any baking, or organized myself in any meaningful way, but that’s ok. I got through the first day, fully nourished, and prepared to start again tomorrow. Well, hello there. It’s been a while. A year or two? Must be two. I recall spending last year remodeling a bathroom during Pascha. No major remodels in the works this year, and I have been blessed with time to be present in church a lot more this year. And here we are – the beginning of Pascha again. Today is Cheesefare Sunday! And at midnight, Great Lent begins. I am always so excited at the beginning of Lent. I look forward to spending extra time in prayer and enjoy the increased awareness of all I have that fasting provides. I feel like every time I stop and choose very deliberately to abstain from eating or drinking what is, essentially, ALWAYS available to me (because really, almost everything is almost always available), I gain an opportunity to turn my awareness more closely toward God. I was sorry to miss Forgiveness Vespers today – traveling home from the beach. I participated a few years ago – it’s really an amazing service. At the end, we say to each other, “forgive me, a sinner.” When you say it over and over and have others say it to you, it really hits home, how often we need forgiveness, and how alike we all are in this. Well, this is it folks. It’s been great sharing my Lenten season with you. Bright Week has come and gone, and I just want to share a few more thoughts with you. I wanted to write about all the services of Holy Week, and I didn’t even get through Holy Thursday. Well. Maybe next year. I did want to share a little bit about the SOYO vigil Holy Friday. Our SOYO (teen youth group), usually spends the night in the church on Friday night, reading psalms before the tomb of Christ. Typically, we put up a sign up sheet and adults sign up for shifts too, coming and going from the church at all hours. This year (remember the podcast by Khouria about the importance of preparing for Lent! ), I failed to put up a sign-up sheet. And so, nobody did come this year. And only three teens could make it. So. It was me, my son, Joey, and his friends, Jordan and Hannah. And it was really wonderful. I participated in the vigil last year as a SOYO parent, and took turns reading psalms, but at that time, there were several adults who stayed the night and sat awake in the church, ALL NIGHT LONG! I don’t know how they did it. Anyway, my point here is, I was with others the whole time, in the church. Not this year. It was just impossible for us to cover the whole night and stay awake (three teens and a middle-aged woman who loves to sleep?). No way. No how. So we took L-O-O-O-O-N-G shifts. Basically, two hours on, three hours off. That doesn’t sound long on paper, but when you’re reading psalms in a dark, quiet church, at three in the morning, trust me. It is. Well, I have to say that it was amazing. First of all, most of the time I was reading, I was alone. Completely alone. The boys were sleeping in Father’s office and Hannah was up in the cry room, and it was just me and the psalms and the tomb of Christ and the Holy Spirit. “1 I will extol thee, my God, O king; and I will bless thy name for ever and ever. Now that Easter is over, the midnight liturgy, the Easter gathering of family and friends, the malted eggs and peeps all gone, (still hiding a few peanut butter eggs. hee hee. ), life has returned to normal. I no longer have to think about everything I put in my mouth, I no longer fix multiple things for dinner to satisfy the fasting and non-fasting members of my family. There are no longer extra services I’m trying to attend. But hopefully, I will carry this Lenten season with me now that Lent is over. Hopefully, I will carry with me the lessons I learned about myself and my relationship to God. And I knew that God had given them to me! To forgive, and to lift them up in prayer. And in lifting them up, I too, was lifted. And just like that, the song disappeared, and I couldn’t remember the sound of it even when I tried! I want to end with a prayer here, but this is all I have (but perhaps, it’s all that’s really necessary). I don’t know what’s going on, and really, it’s probably only a minor miracle, because it’s not really that early (6:30 am), but somehow, I keep spontaneously waking up before the alarm goes off, and NOT falling back asleep again. Generally speaking, my alarm goes off at 6:45am during the week. I shlep out of bed and make Joey and Maddy’s lunches, then return to bed as quickly as I am able so I can snooze some more. Joey comes in and says goodbye at 7:15-ish. Then I snooze some more. Then up at 7:40 am to wake Maddy. Then, snooze until 8 am. She comes up for breakfast, I walk her to the bus stop, then my day begins. Lately, it begins with a yoga class three days a week. Sometimes, with coffee with my friend, Lesley (woohoo for coffee (and a soak!) today!!!). Now, in all fairness to me (all you people rolling your eyes at my morning laziness, you who practically spring out of bed at the break of dawn. You know who you are. ), I generally don’t go to bed until midnight. And except for the 30 minute rest I take almost every day after lunch, I tend to move constantly during the day. So trust me when I say, getting up early is an accomplishment for me! But I take no credit for yesterday or today, it’s just a great thing really. I woke up at 6:30 am, before the alarm went off, and I didn’t even a little bit, feel like going back to sleep. This HARDLY EVER happens. And I’m glad it did, because the next few days tend to be a whirlwind! First, let’s back up a little and talk about Holy Thursday. As I said, there are two services on Holy Thursday. The first is what the kids and I have always call the Pancake Liturgy, although I’m almost positive that there is another, much more official sounding name for it. I’ll look it up on the OCA (Orthodox Church in America) website in a minute. Obviously, the Pancake Liturgy, as its name implies, is a morning service. The second service is the Service of the Twelve Gospels. Yep. That’s right! Twelve. Gospels. Now I know what some of you are thinking (well, I really don’t, but I can guess. In any case, I know what I’m thinking): Wow, really, TWELVE Gospels! That’s Amazing. That’s Incredible. That’s really, really, really, really, really, really, really, really, really, really, really, really long (twelve reallys, I counted). Of course, the Holy Eucharist (Holy Communion) and the betrayal of Christ are pivotal events, but I would like to say something about the washing of the disciples feet, and the agony in the garden. These two events really speak to me about my own relationship with God and Christ. We learn in the church to serve others. I try to practice serving others in my own way, mostly by cooking for my family, but also in the way I help my friends. Nonetheless, I must say that I get a fair amount of esteem out of doing this. Often, when serving, I am praised, or I simply feel good about myself for what I am doing. However, when I serve people in less glamorous ways, I often feel much less than willing. For instance, when one of the kids has the stomach flu, and I’m cleaning up the kitchen floor at three in the morning. There is definitely no one there to appreciate my service. And I am not necessarily feeling very giving. No, not feeling very giving at all. I am pretty much grumbling, and not really feeling like I want to serve at all! The example that Christ sets for us in all things, in the Bible, is truly remarkable. He speaks to our very humanity and shows us the way by His own actions. As parents, we are taught that “actions speak louder than words,” and that we should “teach by example.” And that is exactly what Christ does for us. There’s a reason why we speak of “God, the Father.” Like any good parent, He leads by example and shows us, by Christ’s actions, what is good for us. Christ knelt at the feet of His disciples and washed their feet. Many people in American culture may not understand the significance of this action. In Middle Eastern culture, you could insult someone, simply by showing them the bottom of your feet. The only people who typically washed someone else’s feet were the lowliest servants in the household. So for Christ, the leader of all these men, to get down on His knees before them, and unstrap their sandals and wash their feet, was an act of utter humility in service. Not just service. Humble service. When I contemplate this Scripture, I am humbled by it. I am reminded of how utterly wrapped in pride so many of my acts of service are, and of how unwilling I am to perform what I consider to be tasks beneath me. What I love about Christ crying out in the garden, is the real humanity of His cry, “Lord take this cup from Me.” But then He goes on to say, “yet not My will, but Yours be done.” It’s so hard to say to God, not my will, but Yours be done,” when what I REALLY mean is,”please let Your will be the same as mine!” But as I stated in a previous post, I have learned the error of my arrogance, and so, even though I quite naturally FEEL the desire to have God go along with whatever harebrained scheme I’ve got in mind, I would really prefer to submit my will to His. Really. I would. But this passage is a great reminder of my natural tendency, that is, my NATURE, which is full of arrogance, and quite foolish optimism toward my ability to make healthy choices all by my lonesome!